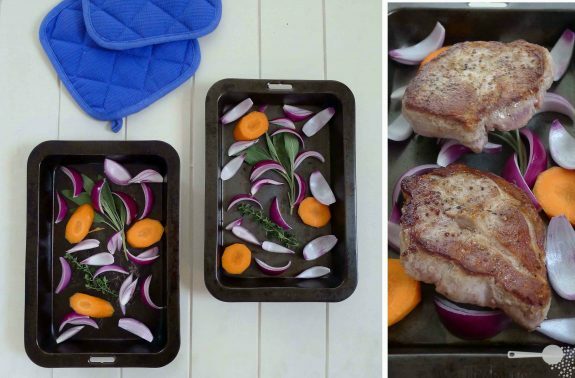 This is a great alternative to a regular Sunday night’s roast and one of my favourite pork dishes. It’s succulent and soft because the meat is braised (cooked in stock) gently and full of beautiful flavours from the exotic spice mix. Best of all, it takes care of itself in the oven so you have more time to do other things, like prepare dessert or entertain friends. Leftovers are great for a quasi-pulled pork sandwich the next day! Just don’t forget to wash your herbs and veggies – there was a spidermum (or dad) in my sage guarding an egg cocoon under a leaf! Yikes! Preheat oven to 180C (350F, gas mark 4). Peel and slice carrots, halve Brussels sprouts and potatoes, quarter onions. Boil potatoes for 20 minutes, drain and set aside to cool. Place stock, a couple of onion wedges sliced finely, one sage sprig, two thyme sprigs, bay levaes, cloves and star anise into a saucepan. Bring to a boil and simmer on low for 15 minutes to develop the flavours. In the meantime, season pork steaks with salt and pepper. Heat a little oil in a large pan until hot and brown the steaks on both sides. Arrange the rest of the onion and herbs in the roasting tray. Transfer steaks into the tray drain stock over the meat. Place some of the onion slices from the stock over the steaks. Cover with aluminum foil and braise for 30 minutes. Reduce temperature to 160C (325F, gas mark 3) and braise for a further 1.5 hours. In the last 30 minutes add vegetables. Serve with mash, roasted potatoes or rice to mop up the delicious sauce. Your photos are absolutely lovely! They make me want to give pork a second chance — I swore off it when it came out dry as a slab of leather on a cowboy’s saddle. In either case, yours looks absolutely delicious! Lol! Seriously, if you’ve had a bad experience with dry roasts, this is the one to try next time… You can probably imagine how the steam and moisture of the stock will help keep the meat moist and juicy. Scotch fillet is slightly fattier too, so will not dry out as easily as loin. mmm your pictures of sage are just divine – spider and all! 🙂 It looks succulent indeed, yum! I made this last week with a slight variation – I seared the pork steaks in the pan and then put everything in the slow cooker. While I was at work, it cooked and I came home to dinner ready to go! Well sort of, I just whipped up a batch of mash to go with it! As usual YUM! You must get one. They are fantastic! I do heaps of stuff in them, soups, stews, you name it. I make the best meat pies with the meat out of the slow cooker. Minimum effort maximum effect , that’s the secret and this recipe has it !! I have a heap of celery to use up. Maybe I could add some to the tray? What do you think? Wow, this was truly delicious. However, I’m glad the sprigs of sage that I used did not come complete with spider and egg as the one you have pictured!